Place yourself in a cutout photo in 3D! To make a unique fun picture for a friend, loved one or even a golfing buddy or guy retiring at work these pictures make a great gift that is both personal and different. 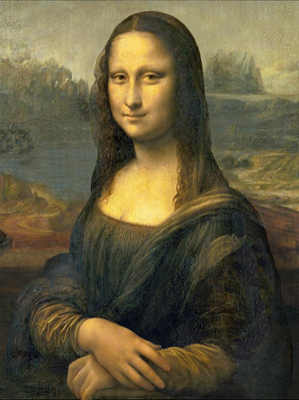 Here is your classic Mona Lisa cut out with a normal cut out picture in 2D alongside the special Snap 3D version in 3D. Roll mouse over picture to see change . You need anaglyph (red/blue) glasses to see the 3D effect on your computer. If you need 3D glasses click Here. However, you will receive a lenticular (no glasses) 3D print in proper colors with no watermark. These prints are available in different sizes depending which image the cut out is going into. For cutouts we also provide anaglyph (red/blue) prints along with the anaglyph glasses. For those that want a fast service these can be sent out right away. To learn how to go about it, what does it cost, what images are available etc. go to our FAQ page. Click Here for FAQ page. To see our Cutout Gallery of 3D image choices Click Here. To see our price list of Cutouts Click Here. To see how your cutout is placed in the original image Click Here.